Express your distinctive personal style by using this Contemporary Bookshelf to display a curated collection of meaningful books, photos, and art objects. Constructed from sturdy wood for durability and sturdiness, this bookshelf features five longitudinal widely spaced shelves that offer ample storage and display space. These shelves seem to be suspended in midair and are secured by an open back semi "A" shape designed frame. Use this bookshelf against a wall, in your bedroom or living room for a furniture piece that radiates contemporary minimalism. 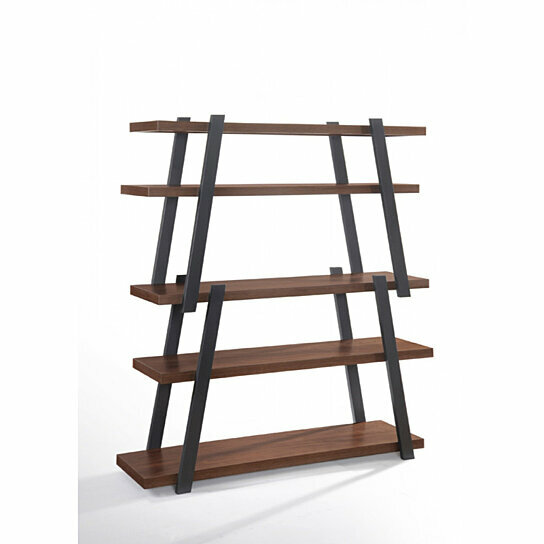 This bookshelf features an open back semi "A" shape designed frame with five shelves. The bookshelf is made from sturdy wood for durability and longevity. The bookshelf will add a contemporary touch to your living room or bedroom.